Something to Muse About: Get Free Comic Books During Halloween Comicfest at a store near you! Get Free Comic Books During Halloween Comicfest at a store near you! Comic and pop-culture fans are encouraged to visit their local comic shop on Saturday, October25th for free comics and participate in Halloween activities, shopping and fun! 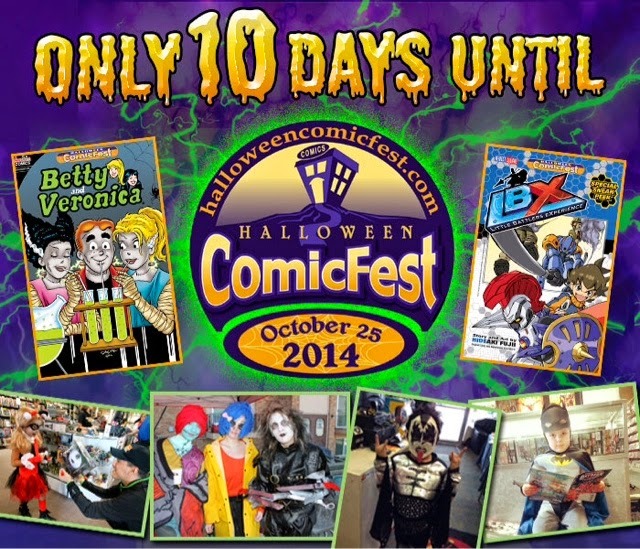 (BALTIMORE, MD) — (October 15, 2014) — In 10 days, participating comic shops across the US, Canada and internationally will hand out free comics to anyone who comes into their shop to celebrate the second biggest free comic book event of the year- Halloween ComicFest! On Saturday, October 25th,anyone who goes into a participating comic shop can choose from 19 free comics and participate in fun activities comic shops host for their customers to enjoy while discovering new types of comics and the treasures found in store. Currently taking place and running until November 9th is “The Greatest Halloween Costume Contest Ever” presented by Halloween ComicFest. The contest takes place on the Halloween ComicFest website,where anyone can enter one of five categories just by uploading a picture of themselves in costume holding one of the free Halloween ComicFest 2014 comics and submitting it into the appropriate category. Prizes include $500 and $100 shopping sprees to the winner’s comic shop of choice in addition to category prizes for the participants who receive the most votes for their costume from website visitors. Voting will take place November 2-9 and it is crucial to remember that only photos with a Halloween ComicFest 2014 comic in the picture will be accepted. ABOUT HALLOWEEN COMIC FEST—Halloween ComicFest is an annual event where participating comic book specialty shops across North America and beyond celebrate the Halloween season by giving away free comic books to anyone who comes into their shops. The event is held the Saturday before Halloween and is the perfect opportunity to introduce friends and family to the many reasons why comic shops are a great destination for Halloween themed comic books, products and merchandise. From zombies, vampires, monsters and aliens to costumes and more, comic shops have it all when it comes to Halloween fun!